This beautiful bracelet shimmers on your wrist like the running waters of a crystal clear stream. This beautiful bracelet will become your favorite conversation starter! Hand hammered, formed and textured, out of 18-gauge sterling silver. This bracelet is has a nice weight yet is very comfortable and fits a medium to large woman’s wrist. 7/16″ wide. 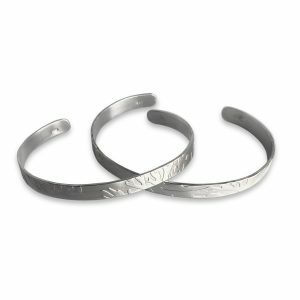 This listing is for the larger bottom bracelet pictured.